More than two million Muslims have begun performing the symbolic stoning of the devil at the end of the annual pilgrimage to Mecca - the Hajj. A sea of white-robed pilgrims made their way to Mina, just outside Mecca, after praying at Mount Arafat on Tuesday and collecting pebbles for the stoning ritual. This year's Hajj is taking place against the backdrop of a looming war with Iraq and growing anger among Muslims over the US policy towards the Arab world. The Saudi authorities have deployed thousands of troops to maintain order and have vowed to crack down firmly on any attempt to disrupt the pilgrimage. Police and armed guards lined the route to Mina, while armoured vehicles patrolled the roads and helicopters hovered overhead. Measures have also been taken to try to prevent a recurrence of stampedes which have claimed hundreds of lives during the ritual in recent years. The pilgrimage, which takes Muslims in the footsteps of Mohammed, Islam's 7th-Century prophet, is the biggest annual mass movement of people on the planet. 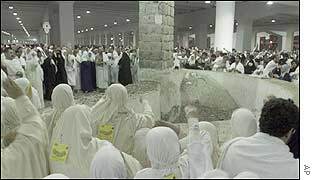 1994: 270 killed in a stampede as worshippers surged forwards during stoning. On Tuesday, pilgrims throw only seven small stones at the first pillar, known as the "big Satan". Then they say farewell prayers and ask God to accept their pilgrimage, which every able-bodied Muslim must make once in a lifetime.